Guy Martin last raced at the Cookstown 100 in 2017 after signing for Honda Racing. Guy Martin is poised to make his Irish road racing return after entering next month’s KDM Hire Cookstown 100. The TV celebrity and former leading international road racer plans to compete in the Classic Senior race on his home-built 750cc BSA Rocket 3. Guy Martin in action at the Cookstown 100 in 2017 on the Honda Racing Fireblade. Martin intended to ride the machine at the Cookstown 100 and Tandragee 100 meetings in 2018 but had to withdraw after running into gearbox problems. Unable to acquire the parts he needed in time to take part, the 37-year-old promised he would return this season. 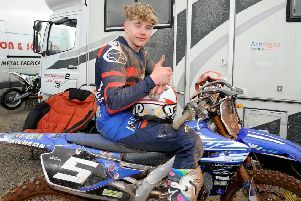 He was heavily criticised on social media after pulling out days before the event last year, but the 11-time Ulster Grand Prix winner has submitted an entry to the organising Cookstown and District Motorcycle Club and is expected to be on the grid for the opening Irish national road race of the season in Co. Tyrone, which takes place from April 26-27. Martin won both Superbike races at the Cookstown 100 on the Tyco BMW in 2015 but struggled on his most recent appearance in 2017, when he rode the Honda Racing Fireblade and a 600cc Honda for Wilson Craig. Guy Martin with Michael Dunlop at the Scarborough Gold Cup in 2016. After taking some time away from the sport following a huge crash in the Dundrod 150 Superbike race in 2015, Martin’s comeback was announced amidst a blaze of publicity in January 2017. He was signed by Neil Tuxworth to join John McGuinness in the Honda Racing team on the all-new CBR1000RR Fireblade SP2. However, it ultimately proved a disastrous return for Martin, with Honda withdrawing from the North West 200 on safety grounds after McGuinness suffered a badly broken leg following a crash on the new bike during Superbike qualifying. Martin himself was later fortunate to escape injury in a frightening spill in the Superbike race at the Isle of Man TT, when he came off on the opening lap at Doran’s Bend. With his confidence in the new Superbike dented, Honda Racing withdrew from the Senior TT and Martin’s short-lived association with the team ended soon afterwards. Media reports later suggested he had retired from racing, but Martin issued a statement on his official website claiming he ‘hadn’t given up on racing or road racing’ and revealing that he still intended to 'race classics and oddball stuff’. Practice for the Cookstown 100 will take place on Friday, April 26, with roads closed from 12 noon. On Saturday, April 27, roads will close around the 2.1-mile Orritor course at 10am for the main race programme.